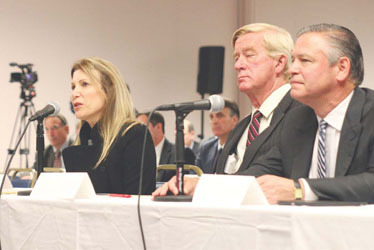 Wynn general Counsel Kim Sinatra speaks to the Massachusetts Gaming Commission (MGC) during license hearings in 2014. She is flanked by former Gov. Bill Weld and current Encore President Bob DeSalvio. Sinatra will resign from Wynn Resorts on July 15, and is remembered here as being a key negotiator in helping Wynn make the final push to secure the Greater Boston region gaming license. day she appeared to be every-bit in control and ingrained in the company. In a quiet announcement buried within a federal Securities and Exchange Commission (SEC) document, the company announced that Sinatra would be leaving her general counsel post on July 15. Wynn Resorts did not respond to the Independent for comment on the shake-up, and hasn’t issued any statements or talked to any other media. There has been no reason given for her departure. Las Vegas media reported that Sinatra would have a severance package of up to $9.5 million. Wynn Shareholder Elaine Wynn – now the company’s largest single shareholder – has disputed that severance package in media statements. Sinatra was a powerful force in the early days of Wynn’s entrance into the Boston market via the Everett site. She was front and center during many of the licensing hearings, in particular a very intense deliberating process at the Boston Teacher’s Union Hall in Dorchester in 2014. During that meeting, Sinatra talked for many nervous moments on the phone with Steve Wynn about whether or not he would commit to additional mitigation measures – that happening in front of the entire room and in front of the competitor, Mohegan Sun. After brokering that deal, Sinatra emerged from the phone with a ‘yes’ to the commitments, virtually sealing the license for Wynn at the time. Since those early days, however, Sinatra has not been at the Encore site too often – only during a few permitting meetings and the major Massachusetts Gaming Commission (MGC) meetings. The 30th Annual Chelsea Chamber of Commerce $10,000 Pot of Gold is around the corner. The event will be held on Wednesday, October 18, 2017 at Anthony’s of Malden, 105 Canal Street, Malden, MA. It will be an outstanding evening filled with great networking opportunities, delicious food and Back to the 80s fun, all while supporting your Chamber. This is the longest running major fundraiser for the Chelsea Chamber! Proceeds greatly contribute to the important work the Chelsea Chamber of Commerce does for the business community in Chelsea. First prize is $10,000. Only 250 will be sold and can be purchased by Chamber members and nonmembers alike. Act now and you could be the next $10,000 Pot of Gold winner! Chairs Sue Gallant and Arthur Arsenault are working with their committee to make the 30th Pot of Gold the best yet! The Chamber will be going back to the 80s when it all started celebrating all the iconic music, fads and outfits from that decade. Prizes will be awarded to the best outfits from the 80s! Get creative and let’s see what you can put together! Maybe you will be one of our prize winners! We also have opportunities to purchase raffle tickets to win Megaraffle baskets that are each valued at over $500. Themed baskets include Nights on the Town with Celtics, Bruins or Red Sox tickets, Ultimate Tailgate Package and a North Shore experience to name a few. We will also raffle off an Instant Wine Cellar where one person will win enough wine to start their own wine Cellar as well as a 50/50 raffle! So many great prizes to win besides the big prize of $10,000! Tickets are $175.00 each. The ticket price includes one entry in the drawing for a chance to win the $10,000 top prize, opportunities to win one of our many fabulous door prizes, one dinner which will include a delicious meal of surf and turf and open bar. Additional dinner tickets can be purchased for $60. Festivities start at 6:00pm with dinner at 7:00pm and the first ticket drawn at 8pm. Sponsorships are still available. Your name will be included on the Chamber website, in social and print media and advertised throughout the event. What a great way to highlight your business to people from all over the North Shore! Only 250 tickets will be sold, so get your tickets now! Check out the Chamber website at www.chelseachamber.org, call the office at 617-884-4877 or drop by 308 Broadway Chelsea today. Rich Cuthie, Executive Director of the Chamber, will be happy to help you pick that winning ticket number! The City and at least two potential partners are looking to establish a short-term wrap around services center in the Bellingham Square area to provide food and shelter to the homeless, prostitutes and drug addicted populations that frequent Bellingham Square. Yet, it’s not coming without some controversy as details of the plan leak out and some try to envision what it might be like – and how it could negatively affect quality of life in Chelsea’s downtown. 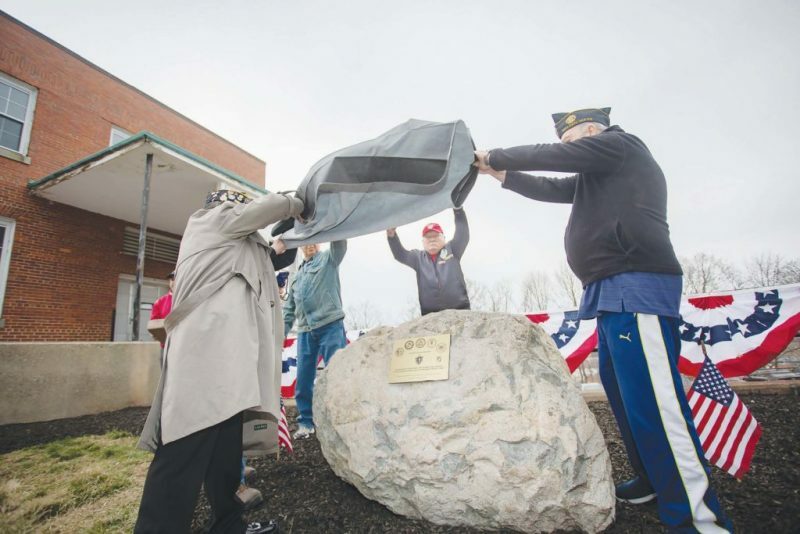 Bob Repucci, long-time director of CAPIC, said in an interview this week that he is ready to move on a plan whereby CAPIC would establish a short-term services building at the old Cataldo site – where Centro Latino was supposed to locate before it went defunct. He said he is aligned with several churches, volunteers, City Manager Tom Ambrosino and other political leaders who are passionate about making a dent in the long-standing problem populations in the Square. “This is a neighborhood center and that’s basically what we’re going to do here,” said Repucci. “We’re trying to embrace these people in the Square and get them the services they need. These people are not going away. They also are not lepers that should be shipped to the outskirts of town. Most of them are from Chelsea and they have alcohol and drug problems. Many grew up here. Many are Latino. We’re going to take these men and women who need help and show them the compassion they need. Repucci said the Center would potentially be open three times a week and would offer a hot meal, a shower, a change of clothes, a clinician by appointment, counseling, financial management assistance, and temporary shelter. There would be 25 people there at at time and no one would be allowed inside if they are intoxicated. It would also be for Chelsea residents and people in Chelsea who are homeless. Those at the service center would also be able to obtain short-term employment by cleaning roofs, shoveling snow and doing other such tasks under supervision. Ambrosino said he does support the proposal out of a stance of compassion and also out of a stance to develop the Square and the Broadway Business District. Ambrosino said the effort by CAPIC to move downtown is independent of the City, but there is potential cooperation through two line-items approved by the City Council on Oct. 19. In fact, two Requests for Proposals (RFPs) have just gone out with $100,000 available for each. The first one will be to provide emergency food and shelter in the form of dedicated short-term detox beds. The second will be to provide a clinician to treat the population in the Square. Ambrosino said he expects CAPIC will bid on one or both of the RFPs and he said he also expects Bay Cove Human Services to bid as well. “I do expect CAPIC is going to bid on one or more of these services that we’re putting out to bid, but those services have nothing to do with the independent project of CAPIC to move some of its services downtown,” he said. Ambrosino said he would expect that the first RFP could be used for folks who need a night or two of shelter until they can get into permanent housing. “This will help folks who have an apartment lined up on Nov. 1, and it’s only Oct. 28 and they need somewhere to go,” he said. Repucci said his plan to move existing services downtown, and perhaps to be a winning bidder on the City’s RFP, is something he believes many in the community are already rallying around – in particular the faith-based community that has noted and discussed the large homeless population in Chelsea. Repucci himself learned firsthand of the problem from City Navigator Ruben Rodriguez last winter, when he was given a tour of the places under the Mystic/Tobin Bridge where may of the homeless and drug addicted/prostitutes tend to live and congregate. He said he learned about the people down there, and he learned their personal stories. He said that gave him a passion to do something about it, and he said he’s a little turned off by the push back from some folks – as he believes this can help a troubled population and solve a long-standing problem for residents. “These people should be rallying around our efforts to change people’s lives,” he said. “That’s the only way to get them off the streets unless they are found dead under the Bridge due to exposure from the cold. We need to embrace these folks and help those who want to change and stop characterizing them as people who don’t want to change. Many of them lived in Chelsea and had decent lives and lost it all due to drugs, alcohol and other circumstances…Those against this should be more concerned about the men and women on Broadway unsupervised. Repucci said he would like to try the idea for two years and collect data and see if it is working. If not, perhaps there’s a better idea. “Again, people maybe don’t support this, but I don’t hear anyone coming up with any other suggestions,” he said. The Chelsea Record and the Chelsea Collaborative have agreed this week to sponsor a candidates’ forum at the Burke Complex auditorium on Monday, Oct. 26, for City Council and School Committee candidates. The forum will seek to include all candidates and to ask questions of candidates in contested races. The goal is to familiarize the public with the candidates and their stances in one of the most hotly contested elections in some time. The forum is open to the public and will be broadcast on Chelsea Cable TV as well. Parking is available in the school parking lot. Collaborative Executive Director Gladys Vega said forums are important in order to have voters who can hold their representatives accountable. The School Committee portion of the forum will begin at 5:30 p.m. in the auditorium. After an introduction, all candidates will answer a first question that will serve as an opening statement, and will have one minute to do so. Those participating will be candidates in contested and non-contested races. There are three contested races on School Committee. Following that, two questions on the issues will be asked of only those candidates in contested races. Those same candidates will also be afforded a 30 second closing statement. Then at 6:30 p.m., a 90-minute City Council forum will begin.Once again, after a brief introduction, all Council candidates – including district and at-large candidates in both contested and non-contested races- will answer the first question, which will act as an opening statement. Following that, only candidates in contested races will participate in the questioning. Only three district seats are uncontested. There will be three rounds of questions asked. The first two rounds will have questions asked by the panel, with candidates getting one minute to answer. The third round will include a “lightening round” of questions – where candidates get only 30 seconds to answer questions. For the at-large race, each candidate will get a different question. For the district races, there will be one question per district so that answers can be compared. Finally, each candidate in a contested race will get a 30 second closing statement. None of the candidates will have the questions in advance, and a representative from the Record and from the Collaborative will ask the questions. The forum is expected to conclude at 8 p.m. The forum owes a debt of gratitude to the Chelsea Public Schools for allowing the use of the school, and to Chelsea Cable for broadcasting the program. Do you have an idea for a question? The Chelsea Record and the Chelsea Collaborative are soliciting questions from the public to possibly be used in the Oct. 26 candidates’ forum. If you have a question on any City issue that’s been bugging or perplexing you about local government or the schools, please submit it via e-mail to seth@reverejournal.com. Include the words ‘Question for Forum’ in the subject line. If it’s a good question, we’ll ask it of the candidates on Monday. Please feel free to submit one or more questions. For some 10 years, using just his eyebrows, Leonard Florence Center For Living (LFCFL) resident Patrick O’Brien – who has ALS and cannot move anything but his eyebrows – worked away at creating what he hoped would be his greatest masterpiece on film. A filmmaker before getting ALS, he was inclined to document the entire process of the disease’s progression, and did so quite well. As the disease progressed, though, it became harder for him to work on the film. Several editors had helped him with the project, but nothing seemed to take the nearly-finished film from good to great. Then, by coincidence, Documentarian Doug Pray entered the picture, and he and O’Brien formed a team that finally got the film out to the world. And the world has loved it. With O’Brien and Pray working together, ‘Transfatty Lives’ was born, and now the film is garnering awards from New York City to Milan. Earlier this year, O’Brien’s film won the Tribeca Film Festival in its category, and just this past Sunday it won the Audience Award at the Milano Film Festival in Italy. His letter came just in time, O’Brien said. Pray said in a telephone interview this week that he is incredibly honored to have worked with O’Brien. Pray said O’Brien had gathered all of the footage – years of footage – and had compiled it for quite some time. The trick was to edit all of the raw footage into a great accounting of what O’Brien went through in his ALS journey – a journey that included lying motionless for several years in a Baltimore nursing home, only able to stare at the ceiling. Once arriving at the LFCFL, the technology and enormous improvement in his quality of life at the facility’s ALS Green House, allowed him to continue his work and to be a key decision maker and director in the editing of his film. Once again, O’Brien did that without the use of any of his body aside from the movement his eyebrows. Pray also said O’Brien’s story about winning Tribeca and Milan – and being able to travel to the Tribeca Festival for his premiere – is a feather in the cap for the LFCFL. The film is not yet available for public viewing due to the fact that it is still in the Film Festival circuit. It will be premiered in Los Angeles later this year, and will have a Boston premiere some time next year, O’Brien said. However, he said people can visit TransFattyLives.com for more information and to view a trailer. t 165 Captains Row on Admirals Hill at 10 a.m. This year Billy Costa of KISS 108 will act as emcee and kick-off the two-mile walk. Media sponsors include the Independent Newspaper Group; major corporate sponsors include Biogen, M&T Bank, AHOA, Kayem and Clifton Larson. Immediately following the walk, there will be a BBQ hosted by Chili’s, doughnuts provided by Dunkin Donuts, face painting, live dance performances, a petting zoo, a photo booth and a raffle. There is a $10 donation fee to participate in the Walk, which includes a Walk for Living tee shirt, the BBQ and all the activities. The Walk for Living is one of the few walks that are dog-friendly. Shaquor Sandiford was once one of Chelsea’s brightest football prospects. The former Chelsea Pop Warner star followed through on that potential by becoming an Independent School League (ISL) All-Star quarterback at the Rivers School and a Division 1 college recruit. A two-sport standout at Rivers, the 6-foot-3-inch Sandiford was the captain of the school’s football basketball teams – and yes, he can dunk. Sandiford led Rivers to its first ISL football title since 1915, earning All-New England honors in the process. One of the highlights came when he competed in the Norm Walker Bowl at Gillette Stadium (Rivers lost 36-28 to Pingree on a blocked field goal return for a touchdown). Sandiford’s spectacular career attracted the attention of many college programs and he eventually chose Springfield College. But he decided to leave college and pursue his entrepreneurial goals within network marketing and building up his personal brand. “I just felt at that point in my life I could achieve more by gaining some real life experiences,” he said. Sandiford is back in the city working at Chelsea Restoration Corporation as a full-time rehabilitation specialist. He is also involved in first-time homebuyer courses, foreclosure prevention counseling, and qualifying families for home improvement loans. The 21-year-old son of Sheanah McCarthy, Shaquor lost his father, Chris Sandiford, during his junior year at Rivers. Mr. Sandiford, a native of Barbados, succumbed to cancer. As a youth, Sandiford was a member of the Jordan Boys and Girls Club where he met Josh Kraft, executive director of the club. An aspiring real estate investor, Sandiford is preparing to teach a first-time home buying course for CRC. He is pursuing a real estate broker’s license. teens that is called Unlocking Potential. He has mentored students from Rivers, JAB Step Inc., and Excel Academy and is seeking to do more volunteer work at some of the non-profit agencies in Chelsea. Shaquor Sandiford was once that Chelsea kid that he now hopes to help find his path in life. The passing of William Scantlebury of Betty Ann’s Donuts in East Boston, famous for his “sinkers” brings to a close another link to a childhood that was much simpler and easier than what our children are dealing with today. (Stephen Quigley is the President of the Independent Newspaper Group).